I would like to invite the leadership of the Ordway Theater to a panel discussion on why I didn’t consult them before creating this poster and why they should be grateful for the extra attention it brings them. Of course that discussion will not affect my already developed plans to circulate the image as widely as possible, but at least it shows I’m listening. I may not actually be available to attend the panel discussion itself (I have a prior commitment to distribute some artwork as widely as possible). It might be best for them to have that discussion among themselves, in any case. Readers who feel motivated to do so are welcome to circulate this image in their online communities. Doing so might encourage that discussion to take place – and art is all about encouraging discussions. 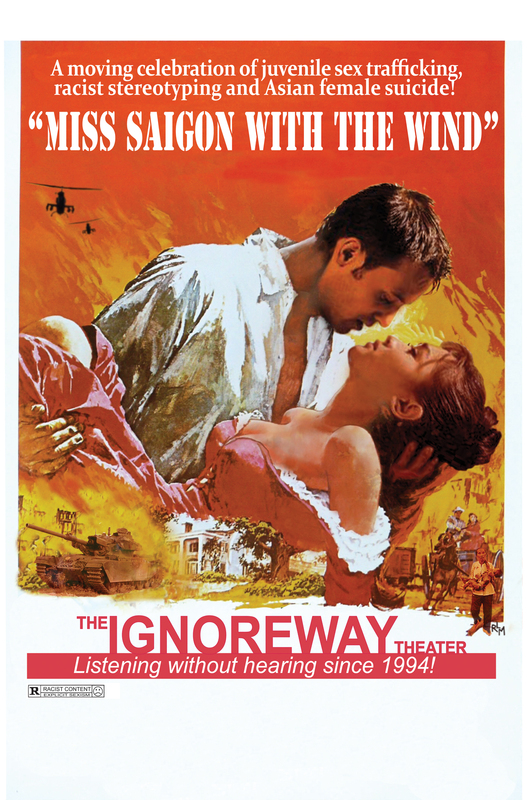 Readers who have don’t know what this image and comments are about (the Ordway Theater’s return production of the racist blockbuster musical Miss Saigon) can check out this anti-review by Sheila Regan and this overview by David Mura.